An international team of researchers has traced the "epidemic ignition" of HIV/AIDS to 1920s Kinshasa, what is now the capital city of the Democratic Republic of the Congo. 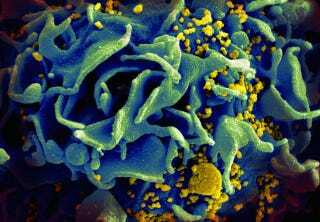 An international team of scientists led by the universities of Oxford in Britain and Leuven in Belgium reconstructed the history of the HIV pandemic using historical records and DNA samples of the virus dating back to the late 1950s. The DNA allowed them to draw up a family tree of the virus that traced its ancestry through time and space. Using statistical models they could push farther back than the 1950s and locate the origin of the pandemic in 1920s Kinshasa. People with HIV in central Africa at the time did not have specific symptoms that would have been written down in their medical records. The virus causes the immune system to collapse, leaving people open to all manner of infections. "For an epidemic like HIV where we're trying to track back to before it was even discovered, genetics is the only source of information we have," said Oliver Pybus, an evolutionary biologist at Oxford University and senior author on the study. The genetic data suggests that pandemic HIV spread rapidly through the Democratic Republic of the Congo, a country the size of western Europe. From the late 1930s to the early 1950s, the virus spread by rail and river to Mbuji-Mayi and Lubumbashi in the south and Kisangani in the north. There the virus took hold and formed secondary reservoirs from where it spread to countries in southern and eastern Africa. To be clear: The AIDS virus is believed to have spilled over into the human population years before it gained purchase in Kinshasa, but conditions there were such that the infection was first able to proliferate and spread. It did so quietly at first, stealing its steady way through the surrounding area for several decades before thundering, deadly and swift, across the globe.